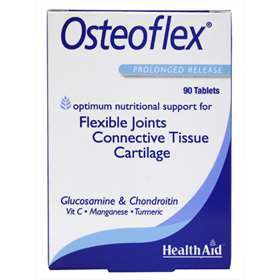 Osteoflex is formulated to provide nutritional support for healthy joints and cartilage. Health Aid's unique combination of high grade Glucosamine, Chondroitin Sulphate with added Vitamin C, Turmeric and Manganese to help maintain supple, flexible joints, strong cartilage and a healthy skeleton. Suitable for men and women of all ages. Diabetics should consult a doctor before taking this supplement. Do not take this product if allergic to shellfish. Glucosamine Sulphate (2KCI), Chondroitin Sulphate, Bulking Agent (di-calcium phosphate, microcrystalline cellulose),Vitamin C (ascorbic acid), Stabiliser (croscarmellose sodium), Anti-caking Agent (silicon dioxide, veg, Magnesium stearate), Manganese Gluconate, Binding Agent (PVP), Glazing Agent propyl methyl cellulose (HPMC),Turmeric Root Standardised Extract (10:1). Health Aid Vitamin D3 1000iu 120 Tablets. Health Aid Vitamin E 1000iu 30 Capsules.